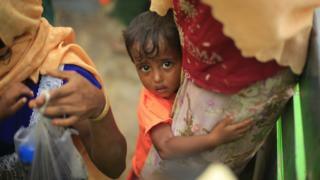 Based on surveys of refugees in Bangladesh, the number is much higher than Myanmar's official figure of 400. Is the refugee crisis 'textbook ethnic cleansing'? The problem would be that Myanmar has not ratified the Rome Statute of the ICC and is not bound to co-operate with it. Bringing a case would require the approval of all five permanent members of the UN Security Council, and China has until now given its full support to the Myanmar government's handling of the crisis. The government's assertions contradicted evidence seen by BBC correspondents. The United Nations human rights chief has said it seems like "a textbook example of ethnic cleansing". Image caption MSF says the experiences recounted by refugees were "horrific"
"What we uncovered was staggering, both in terms of the numbers of people who reported a family member died as a result of violence, and the horrific ways in which they said they were killed or severely injured," MSF Medical Director Sidney Wong said. "The numbers of deaths are likely to be an underestimation as we have not surveyed all refugee settlements in Bangladesh and because the surveys don't account for the families who never made it out of Myanmar," Mr Wong said. MSF said the agreement was "premature" pointing out that "currently people are still fleeing" and reports of violence have come even in recent weeks.